L’ACADCO – A United Caribbean Dance Force will be remounting its 26th Season of Dance for three additional ‘back by popular demand’ performances. 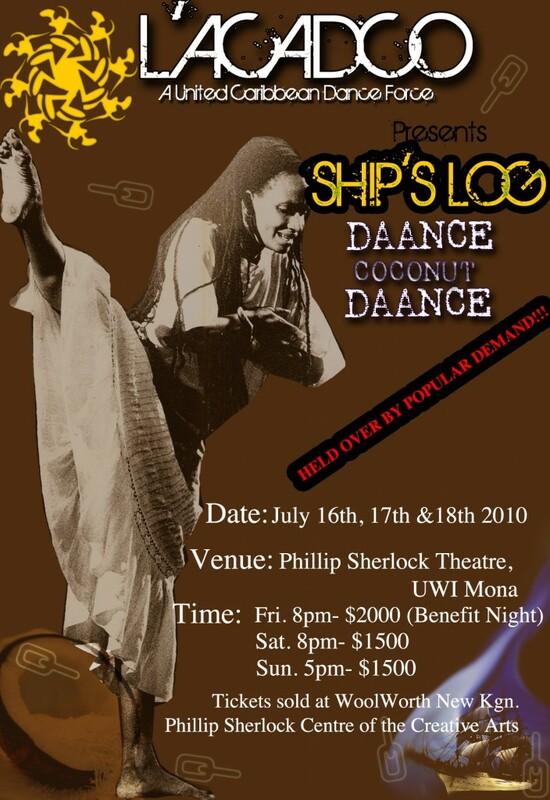 The critically acclaimed dance presentation titled “SHIPS’ LOG – Daaance Coconut Daaance,” a historical account of our heritage from slavery to the present day, which will take place at it’s original venue, the Philip Sherlock Theatre, UWI on July 16, 17 and 18. The company is again pleased to have Jamaican dance icon and pioneer Ms. Patsy Ricketts as a special guest performer. Ms Ricketts has been very instrumental in the early shaping of Jamaica’s dance image both locally and internationally. Her efforts include work with institutions such as the National Dance Theatre Company, Stella Maris Dance Ensemble, Excelsior Community College, L’Acadco and more recently the Rising Stars competition, to name a few. An additional treat will be Artistic Director and Founder Dr, L’Antoinette Stines’ performance as the role of Madda/Kumina Queen. See YardEdge interview with L”Antoinette Stines. Ships’ Log – Daaance Coconut Daaance will celebrate and showcase choreography from seasoned dance practitioners, as well as young choreographers: Dr. L’Antoinette Stines, Aaron Obaefun Vereen, Jacqueline Logan, Adrian Wanliss, Amanyea Stines-Jones, Barbara Ramos-Caballeros, Patrick ‘Hiyah Style’ Morrison, Schoy Stewart, Renee McDonald (The Company Dance Theatre) and Sasha Christian. The production also includes dramatic sequences and poetry/spoken word written and scripted by Fabian Thomas.